To prepare the ham: Trim off some of the fat, leaving a 1/4-inch layer. Score the remaining layer of fat into a diamond pattern by cutting 1/4 inch to 1/2 inch deep into the meat, forming 1 inch to 2 inch squares. Not only does scoring look nice, it allows any remaining fat to render from the ham and provides a greater surface area for the glaze to stick to. To brine the ham: Cut crosswise slits, all around the ham, about 1/2 inch apart, halfway through ham to where knife touches bone, if any. Place the water in a deep bowl, a large pot or a large, re-sealable food-safe plastic bag. Stir in the sugar. 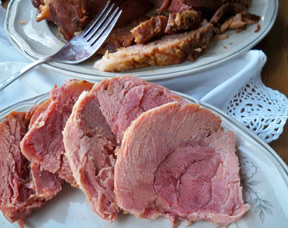 Soak the ham in the brining liquid for at least 2 days in the refrigerator, turning the ham once or twice each day. Drain off the brining liquid. To glaze the ham: Place the ham in a roasting pan lined with enough foil overlapping the edges to wrap it completely. Mix together the honey, brown sugar, orange juice, ginger and dry mustard in a small bowl. Pour the mixture all over the pork and rub the glaze evenly over the ham. Stick the cloves in the diamond-shaped slits on the top of the ham. Wrap tightly with the foil. 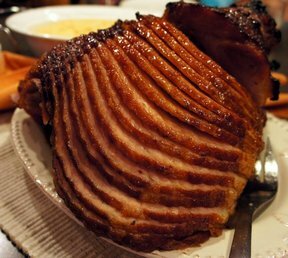 After glazing, it's best to allow the ham to sit at room temperature for 1-2 hours before cooking. Pre-heat the over to 200 F. Bake the ham for 6 to 7 hours or until done, unwrapping and basting the ham occasionally with the glaze and any liquids that may have accumulated in the foil. For a slightly crisper skin, unwrap the ham and bake it at 450 F, about 15 minutes.